Appearance is everything, are your Showroom tiles looking tired? We were asked to clean 3 bathrooms and the passage in this showroom to see how they would come up, we knew they would look great however the client was sceptical! With almost 10 years of Commercial Cleaners vacuuming and wet mopping 6 days a week you would expect the grout lines to be a lot cleaner than they were. The comments from their customers and the client them self has been amazing, many thought they had the Tiles replaced! We will come out to you and inspect your Tile & Grout, and give you a written quotation to bring them back sparkling again. 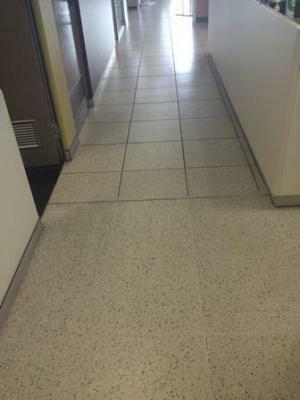 For all your Tile and Grout, or Carpet cleaning needs in Perth Western Australia, Contact What Mess? Cleaning Services today.